Okay, I admit it. I had a tear in my eye and a lump in my throat, as I pretended to have an allerdy attack. The simple truth was, I was emotionally overcome. There have only been a handful of non-family related instances, where saline has collected from an overflow from a lacrimal gland. One was when the New York Jets won the AFC East division title in 1998 under Bill Parcells' command. Another was the day I learned Jerry Garcia died. Yet another was the night that Dale Earnhardt Sr. died, while driving his Number 3 car at Daytona ten years ago. The most recent appearance of a tear in my eye, occurred last night, when Dale Earnhardt Jr. piloted The 3 Car flying the blue and yellow Wrangler colors, to victory lane at Daytona in a Nationwide race. As Junior passed the finish line in Florida, hordes of race-watchers in the stands extended both arms in the air, with three fingers on each hand pointing to the sky, to the very NASCAR Heavens where Dale Senior was no doubt looking down in amazement as his son won the race in his car, painted in in the Wrangler colors that Dale Sr. made so famous, before changing to the Black Number 3. Patty and I were unabashed "Intimidator" (Dale Earnhardt Sr's. nickname) fans. A bright and shining light was extinguished in the world when Dale Earnhardt passed away. Last night, that light rekindled itself in a blinding flash, in the reincarnation of The 3 car. 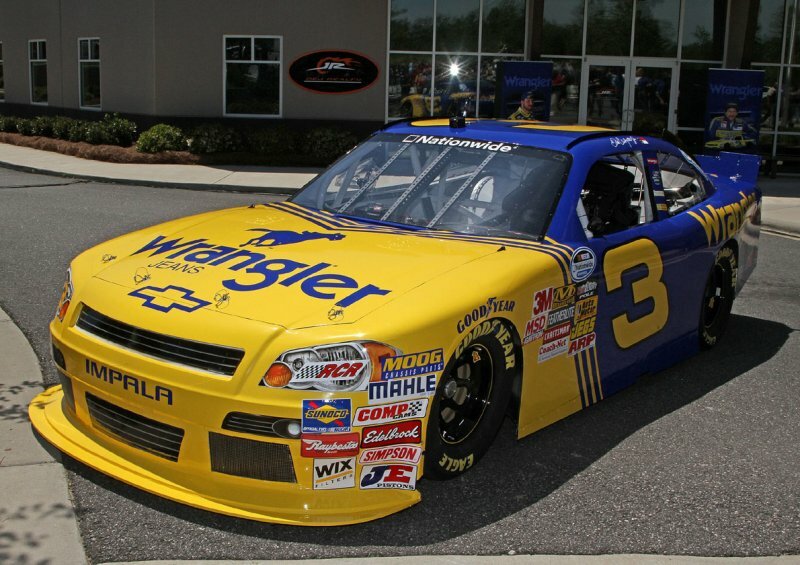 With Dale's son driving for all he was worth behind the wheel of the blue and yellow 3 car, and driving for all the fans who'd hoped that Junior would carry on the vaunted Earnhardt legacy of winning, Junior once again succeeded in elevating human spirits. An Earnhardt once again inspired and gladdened the heart, the way that Dale Sr. did with his winning ways. . Sadly, Junior's had quite a dry spell since his last NASCAR victory. But last night, his win wiped out all of the frustration that Earnhardt fans have experienced for the past few years. Last night, Dale Earnhardt Jr. became his father, in his father's Number 3 Car. Congrats, Junior. Keep up the good work. I'll tell ya what, though. This race made my year. If Junior doesn't win another NASCAR race in 2010, I'll still be a happy camper. Last night, Patty and I extended our arms into the air in front of the TV, pointing to the NASCAR Heavens with three fingers on each hand lifted in an act of solidarity with other Earnhardt fans. Who says that sports are unimportant for human sustenance? Later.